Season eight is the last season of The Simpsons I own on DVD. I own DVD sets of a lot of shows, and many of those sets are incomplete, but typically, the gaps are by accident; I only own seasons one, four, and five of The Wire, for example, because I bought the first one, and got the last two free from a (incredibly awesome) friend. But with The Simpsons, the incompletion is a conscious choice. There are a number of episodes post-season eight that I enjoy, but not enough of them in any one season to make me want to spend the 30 bucks necessary to own that season on disc. Part of this is nostalgia, I’m sure; I know I watched the show regularly for a long time, but season eight was the last time I saw everything as it aired. It was the last time the show really felt like it was mine, if that makes sense; the way something can be such an essential part of your life that you forget that it was created by strangers who know nothing about you, and wouldn’t much care if they did. I say all this because re-watching “The Springfield Files” for this review, I was struck by how not all that different the episode is from what was to come. The plot’s relatively strong (in that the arrival of Mulder, Scully, and their X-Files vibe is well-justified, and their presence is more than just an excuse for a quick series of pop-culture references), but there are a lot of cutaway jokes, and some of those work better than others. One of the problems with the show after season eight is that the writers would come to rely more and more on semi-random riffs to fill up the running time—material which, while not always bad, didn’t build on anything before or after, and, at its worst, wasn’t even connected to the characters and the show itself. A truly terrible cutaway gag is something that is both unfunny, and which could’ve been told in any particular context; like a drama needs stakes and rising action to build tension, great comedy needs material that comes from character and situation to be more than the sum of its parts. For example, take the “Budweiser frogs eaten by an alligator that says Coors” joke that happens roughly two-thirds of the way through this episode. Homer and Bart are waiting by the woods to see Homer’s “alien,” and off to the side, three frogs sitting on lily pads reenact what was, at the time, a fairly famous commercial. Then the alligator eats them. It’s mildly amusing, and better than just having the frogs alone would’ve been, but it has nothing to do with anything. Random humor can be effective, and I’m not going to argue that this one bit kills the episode (or even that the episode is dead—this is a solid half hour, for reasons I’ll get to shortly), but it’s lazy and distracting, and there are uncomfortable hints throughout that this sort of material is going to be more typical in the future. Which makes sense, honestly. This is the eighth season, after all, and as frustrating as it can sometimes be to watch The Simpsons spin out its wheels in perpetual comfortable mediocrity, it’s worth remembering that the the decline was less a crime against art than it was a likely inevitability of television storytelling. 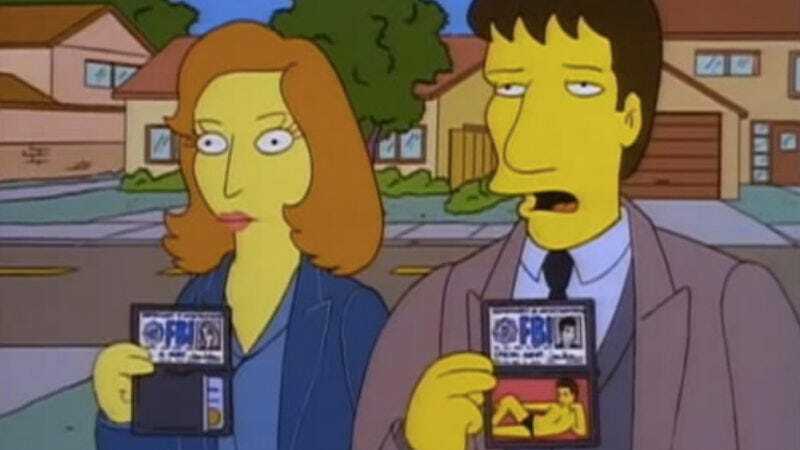 When “The Springfield Files” aired, The X-Files was in the middle of its (excellent) fourth season, but by the time that show hit its own eighth year, it had long since passed its peak. Very few shows last this long without suffering a significant decline; I have this weird theory that TV series’ premises have their own secret expiration date built in, no matter how open-ended they appear, but let’s just say for now that while it’s possible to see the developing flaws that would one day come to dominate the series, this is still a lot of fun to watch, and for the most part, its head (“heart” doesn’t really seem relevant) is in the right place. To offer a counterexample to the frogs joke: Early in the episode, after an introduction from Leonard Nimoy himself (the story has a framing device that’s a gag on In Search Of…, a kind of proto-Unsolved Mysteries for the paranormal and otherwise that Nimoy hosted after Rod Serling’s death), with Homer ducking out of work early to get drunk, as Homers do. There follows a series of short sketches about various characters enjoying their Friday afternoons, including Doctor Hibbert (he leaves Hans Moleman behind the x-ray machine) and Donkey Kong, which is as random as the frogs joke but at least has a monkey throwing a barrel. We see Milhouse loading 40 quarters into a Waterworld arcade game, a joke on how hugely expensive the movie was to make. After he finishes loading the machine, he moves the character on the screen one step forward, then gets a “Game Over” sign, and the request for forty more quarters. The reference to Waterworld is almost instantly dated, although the absurdism of the arcade game is funny on its own; but what makes this really work is the shot of Milhouse complaining, then sighing, and finally starting to load more quarters into the machine. That’s a character-specific joke. You could’ve done this with someone else (Bart, maybe), but it wouldn’t have been as funny as it is with Milhouse, because his pathetic (and sadly relatable) willingness to participate in his own degradation is a fundamental aspect of who he is. This is humor that both works in the moment, and reinforces our understanding of who this kid is, and how he fits into this world, and it’s the sort of writing that drove the show at its peak. Thankfully, most of the humor of “The Springfield Files” follows this route. Even the goofy stuff with Nimoy works because there’s a consistency to who he is on the show. (Hell, it’s even consistent with his last guest appearance, “Marge Vs. The Monorail.”) Moe freaking out because two FBI agents end up in his bar? Makes sense. The fact that he has a killer whale from Sea World in his backroom? It’s ridiculous, but it’s grounded enough in our sense of Moe as a man capable of any sort of under-the-table crime (provided he isn’t actually evil) for the ridiculous to be as funny as it is unexpected. Even the resolution of the mystery—the “alien” Homer sees is just Mr. Burns after a series of complicated rejuvenation treatments—comes from what we already know about these characters. There are plenty of random nods, but only a few of them are as distracting as the frogs joke; and while the randomness does keep the episode’s story from being as satisfying as the show could be at its best, it never comes close to derailing. Mulder: Look at this, Scully: There has been another unsubstantiated UFO sighting in the heartland of America. We’ve got to get there right away. Scully: Well, gee Mulder, there’s also this report of a shipment of drugs and illegal weapons coming into New Jersey tonight. Mulder: I hardly think the FBI is concerned with matters like that. Both Duchovny and Anderson do terrific voice work here, their dry delivery tweaked only slightly to fit in with their new surroundings. (Anderson is, if anything, even more restrained than she is on The X-Files, which makes her lines funnier; Duchovny does a great thing where you can actually hear the actor smiling when he says “FBI.”) And throughout, the writers show an understanding of the material they’re parodying that keeps that parody from being too simplistic or shallow. Seeing the Cigarette Smoking Man lurking in the background during one scene is a nice touch, but the episode even manages to work in a classic Chris Carter purple prose monologue for Mulder to recite before he and Scully drop the case. That’s so close to Carter’s writing style that it barely counts as parody. “The Springfield Files” isn’t The Simpsons at its best. There’s no real emotional core to any of this, as Homer’s quest to convince someone, anyone, that he’s telling the truth isn’t all that compelling, and Marge’s comment at the end about how he accomplished his goal is empty and trite. But the humor and characterization are strong enough that this doesn’t really matter. Like so much of the eighth season, this is an episode of a show settling in for the long twilight of its declining years. The signs are easier to notice in retrospect, and that takes some of the fun out of things. But thankfully, there’s still some fun left over to take. But you shouldn’t take all of it, because then there would be no fun, because we had taken what was left of the fun, and what would we then be left with, without the fun that we, ourselves, had already taken. The score does an excellent job throughout of aping Mark Snow’s work on The X-Files. Nimoy’s opening monologue is a riff on Criswell’s introductory speech from Plan 9 From Outer Space. Homer describing the plot of Speed while using the word “speed” over and over, without being able to remember the movie’s actual title, is one of my favorite Homer moments. “Lisa, when you get a little older, you’ll learn that Friday’s just another day between NBC’s Must See Thursday and CBS’s Saturday Night Crap-O-Rama.”—Bart, telling hard truths which are no longer relevant. Marge doesn’t get a lot to do in this one, but her freakout over accidentally stealing a pen from the post office is great. Speaking of Bart, it’s nice that he’s the only one to actually believe Homer. “It’s your birthday?” “Yes! Remember, it’s the same day as the dog’s.” And then everyone except Homer starts lavishing the dog with affection. It’s great. 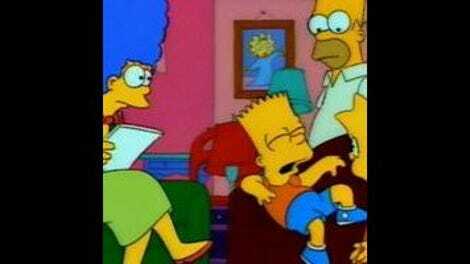 Homer and Bart make fun of Fox, which aired the “alien autopsy” hoax video at one point, and thus deserves all the scorn we can heap on it.